Structure: Last, First M. “Article Title.” Website Title. Website Publisher, Date Month Year Published. Web. Date Month Year Accessed. <URL>. Citation: Satalkar, Bhakti. “Water Aerobics.” Buzzle.com. Buzzle.com, 15 July 2010. Web. 16 July 2010. <www.buzzle.com>. Citation: Brown, Damon. 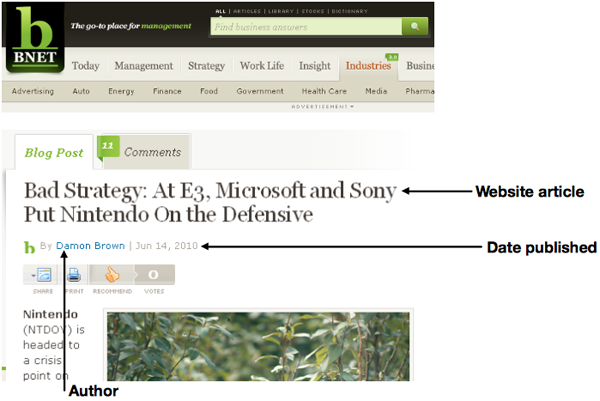 “Bad Strategy: At E3, Microsoft and Sony Put Nintendo on the Defense.” BNET. CBS Interactive. 14 June 2010. Web. 15 June 2010. 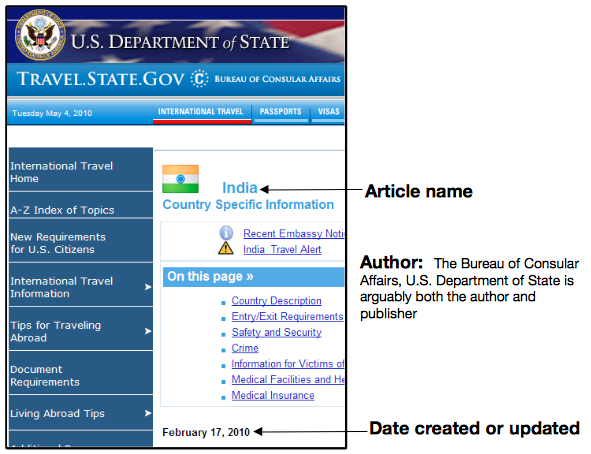 Citation: Bureau of Consular Affairs, U.S. Department of State. “India.” Travel.State.Gov. Bureau of Consular Affairs, U.S. Department of State, 17 Feb. 2010. Web. 4 May 2010. <http://travel.state.gov/travel/cis_pa_tw/cis/cis_1139.html&gt;. Structure: Last, First M. “Article Title.” Blog Post Type. Website Title. Website Publisher, Date Month Year Published. Web. Date Month Year Accessed. <URL>. Citation: Schonfeld, Eric. 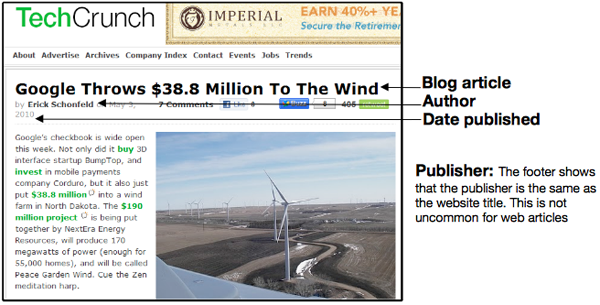 “Google Throws 38.8 Million to the Wind.” Web log post. TechCrunch. TechCrunch, 3 May 2010. Web. 4 May 2010. <http://techcrunch.com/2010/05/03/google-38-8-million-wind&gt;. View additional citation examples on how to cite a website in MLA format.